A bright, white is smile is something everyone wishes to attain. However, with a multitude of over-the-counter teeth whitening products, it’s difficult to know what will provide the best results. At Park Slope Family Dentistry, we offer professional in-office and take-home teeth whitening treatments to brighten our patients’ smiles. Ready for a brand new smile? Contact us today to schedule a teeth whitening appointment! If you’re dedicated to your oral health, and have an in-depth hygiene routine, but find that your smile is not as bright as you’d like, teeth whitening is for you. While there are many reasons teeth become discolored, stains can be classified as intrinsic or extrinsic. Extrinsic stains are those on the surface level of your teeth. Habits such as consuming teas, coffee, and wine, can create stains on your smile. Smoking and chewing tobacco result in a yellowish stain to the teeth as well. 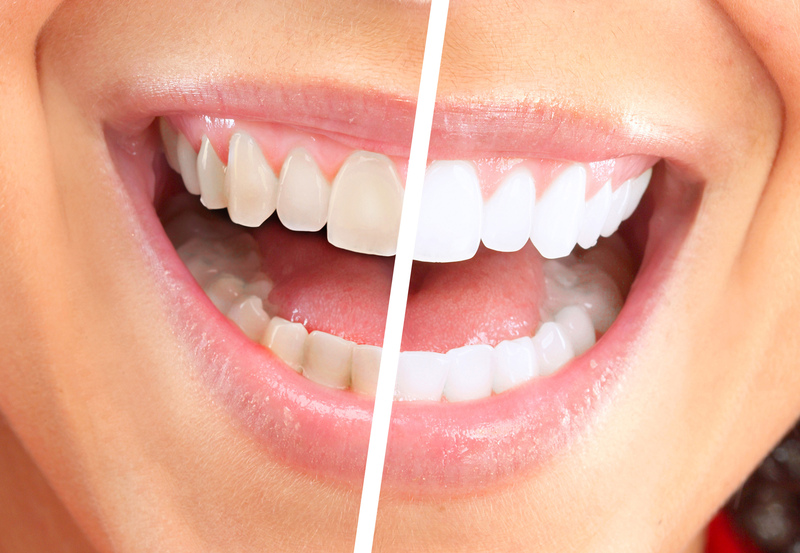 The discoloration left behind by these stain-causing agents can be lifted with constant care and professional teeth whitening in Brooklyn from Park Slope Family Dentistry. Intrinsic stains come with age and trauma, causing discoloration from the inside out. As we get older, dental enamel gets thinner, revealing a yellowish soft material called dentin. Experiencing trauma at a young age and falling to seek proper treatment can also create darkened enamel. In these cases of damage to teeth, infection and bacteria deaden tooth pulp, which makes teeth look brown. With these issues, professional teeth whitening and tooth-colored prosthetics can effectively combat discoloration. At Park Slope Family Dentistry, we provide teeth bleaching services to meet your aesthetic goals. Our in-office treatment takes about an hour; in just one appointment you can reach the shade you desire. We take the time to first ensure your smile is as healthy as possible before moving forward with aesthetic treatments. We understand that a healthy smile is a beautiful one. Take-home treatments allow you to control when you whiten your smile, while still being supervised by our Brooklyn dentist. We create the custom trays so that the teeth whitening gel reaches all the contours of your smile. We utilize high-quality gels in to completely whiten the smile, for both our take-home and in-office treatments. Our dentists walk you through each procedure, how much gel to place in your custom trays, and how long to wear these trays at home. Our Brooklyn neighborhood dental practice, Park Slope Family Dentistry, provides cosmetic teeth whitening to patients throughout the surrounding communities. For more information about our comprehensive dental treatments, contact our Brooklyn dental practice today.